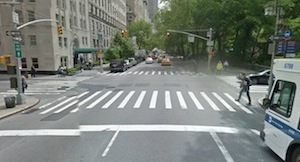 A tow truck driver struck and killed an 86-year-old woman walking on the Upper East Side yesterday morning. The driver was turning left from Fifth Avenue onto 65th Street at 9:30 a.m. when he hit the victim, who was walking north in the crosswalk, according to the NYPD. An NYPD spokesperson said that “no criminality is suspected at this time” but that the investigation is still ongoing. Police did not have any further information about who had the right of way, but the known circumstances strongly suggest that the driver failed to yield to the victim while she had a walk signal. Unless there’s some sort of special signalization involving exclusive turn phases (very possible), anytime a driver on a street has a green light, so does the pedestrian walking alongside that traffic. This is the default situation for left-turning vehicles, and for the NYPD to assume ‘no criminality’ sends a strong message to anybody walking across the street that when it comes to left-turning vehicles, they’re Not Your Police Department. So either the driver didn’t yield to a pedestrian who had the right of way, or ran the red light. Sounds like they broke a law one way or the other. She was walking north. He was going south. He had to have looked right in her face before hitting her. I see this everyday. He sped around his turn without a care in the world, seeing how fun it is to turn the corner real fast. if he had killed her with a gun or knife, trouble for him. kill with a car, no problem. go have lunch. Issuing such a resolution condemning a small, powerless group for infractions that have resulted in zero deaths while simultaneously ignoring a large, powerful group whose actions have resulted in dozens upon dozens of deaths is morally reprehensible. It’s a moral question at this point. The victim was my spunky, extraordinarily capable grandmother — the most cautious and enthusiastic pedestrian I know. She was on her way to her weekly volunteer work. I share and appreciate your outrage. This horrific manslaughter took place in the 19th Precinct. The station house is just a few blocks away from the scene of the crime. The next meeting of the 19th Precinct Community Council meeting is Monday, November 7th at 7pm. Why don’t 25 people show up to this meeting and tell Inspector Matthew A. Whelan that it’s not OK for him to let the the killer of a nice old woman simply get back in his vehicle/weapon and drive off, potentially, to do it again to someone else. Why don’t we ask Inspector Whelan how he’d feel if the police treated his grandmother like this. Did they inspect the surveillance footage that is no doubt available from that avenue to determine how fast the truck was going, how far it (a commercial vehicle) had been traveling down Fifth Avenue, etc? Don’t let Manhattan DA Cyrus Vance Jr off the hook. He can investigate any pedestrian fatality independent of the police, and bring charges regardless of police findings. Crusading DA’s have done far more to bring killer motorists to justice than the cops. It was DAs, not the cops, who got tougher drunk driving laws, and tougher penalties for scofflaw motorists. The trucks speed going down 5th avenue would be irrelevant. The vehicle could have been going a consistent 40mph for 20 blocks, but that would not be reveleant in how the truck hit the pedestrian. And in this case, it was a failure to yield. It doesnt take a lot of speed to kill an older defenseless person. A failure to yield is the main culprit here. I’m starting to think maybe criminal prosecution is an ineffective traffic safety tool because there is so much reluctance to ever use it. I propose a better tool would be to require a mandatory license suspension of some period–say 60 days–and employer notification for any motorist who injures a pedestrian or cyclist. You can certainly have your license suspended for any number of other reasons that don’t cause bodily harm. This wouldn’t automatically give people criminal records or require prosecution, but it would certainly motivate drivers to be as careful as possible–especially if there livelihood depends on it. A Dutch guy told me drivers in Netherlands are by default responsible for the medical bills of any ped or cyclists they hit, and as a result drive very carefully. Up to this point I thought it was only ok to run people over if they weren’t in the crosswalk, but I guess now it’s ok to run them over no matter what. Duly noted. Such sad news, my heart goes out to her family and friends. The speed of the driver as he turned from the avenue to the street is absolutely relevant. 1. Speeding is against the law and, if he had an NYPD that did and investigation and compiled offenses, would be one more charge to add to the list. 2. The faster the driver was going as he took the turn, the longer it would have taken him to stop after seeing a person in the crosswalk, especially in such a big vehicle. More contributed to this incident than just a failure to yield. People who take turns at a cautious 10 mph are less likely to kill someone. In fact, they’re less likely to hit someone in the first place. I wouldn’t write off speed as a factor at all. Try turning a corner in your car at 30 mph and see if you don’t crash. I seriously doubt any truck, even a tow truck, could take a hard turn at 30 mph or higher. While it is probably very likely that the driver was turning at a speed faster that what would be reasonable or safe, I think it is unlikely that the driver was technically speeding while making the turn. If anything could be charged, it might be reckless driving, although we all know that is unlikely (even though we all know tow trucks are generally reckless drivers). I’d bet money the driver also failed to signal, and wouldn’t be surprised if they were on the phone or otherwise distracted. it does not matter how slow or fast he took the turn. i see these truck drivers all over. it is not their car, their gas or their wear and tear. they abuse their vehicles. I see them turn corners without stopping. tow trucks have huge bumpers and even if youre not going 30 you dont have to be going fast to whip around a corner and kill someone. we need turning lights at all intersections. in barcelona there are turning lights and pedestrians get their own time to cross while turners have to wait. Was she wearing lights? I’m sure the tow truck driver simply didn’t see her. So it’s all OK, right? This actually makes a good case for prohibiting turns altogether. Basically, prohibit motor traffic on most cross streets during the day (except emergency vehicles), thereby prohibiting turning by default. Make the cross streets bicycle/pedestrian only, except late nights when deliveries are allowed. Better yet, get rid of 9 out 10 cross streets altogether and join the blocks into a superblock. Even though they’re frequently derided nowadays, I think superblocks are a great concept because they allow wide swaths of land free from the noise/confusion of motor traffic. Make every 10th or 20th block a bidirectional crosstown route where turns from Avenues are allowed. Remember that the Manhattan grid spacing was designed at a time when traffic averaged walking speed. Blocks spaced 20 to a mile were about 30 seconds to a minute apart. You don’t need blocks spaced this closely now. If a motorist needs to drive an extra 5 blocks on average to make a turn, that’s only 30 seconds at 30 mph. And it’s no big deal for a driver or their passengers to walk at most an extra half a long block if access to the cross street they want is denied. Subway riders do it all the time. The less convenient driving is, the fewer people will do it. With its heavy pedestrian traffic, Manhattan is the last place in the US which should be making any provisions at all for motor traffic. If it were up to me I would ban all motor traffic except buses, delivery trucks, and emergency vehicles from the island. And tow truck drivers are the worst bar none. I routinely see them going 60, 70, even 80 mph on local streets here. @station44025:disqus , I also agree with a mandatory license suspension. But 60 days? I was thinking more like 5 years. a tow truck would not likely be able to take the turn more than 20mph. however, a turn on a cross street should not be at speeds more than 5-10mph considering there is almost always a pedestrian regardless of the vehicle. so again, it is not the speed of the tow truck barelling down 5th avenue. it is that the driver of the tow truck was either reckless causing a failure to yield or a combination of other inattentive actions that killed the pedestrian. in this case, perhaps there was no “criminality” suspected. but there certainly is a barrage of violations that are warranted. Isn’t that part of 5th Avenue “No Commercial Traffic/Local Deliveries Only”? While these drivers are not charged criminally, that does not mean there are not repercussions. I know one driver who was the cause of a pedestrian fatality and was not charged (it was covered here on SB). The driver lost his license for some time, and when he finally got his license back, was unable to return to his job as a truck driver because he was essentially un-insurable. I know it’s not the same as having criminal charges filed (In this particular instance I think criminal charges would have been appropriate), but not being charged did not mean this guy was able to go about his life as he did before. I don’t say this implying the loss of his license and job was an adequate punishment, just to point out that there are (at least some) consequences to fatal accidents that we the general public do not see. The woman who was killed was my mother. She was crossing the street with the green light and in the crosswalk. She was in unbelievably good physical and mental condition for a woman of her age, and was on her way to her volunteer tutoring work at the English-Speaking Union, a few doors down East 65th Street. The tow truck driver not only hit her, but ran her over; her injuries were horrific and massive beyond belief. He “didn’t see her” and, according to witnesses, didn’t even know he’d run over anyone until he was pulled over. My mother was very important to her family, her friends, and her community. We have had the most miserable week of our lives. Over 200 pedestrians are killed by vehicles in NYC each year, most of them occurring when a vehicle makes a left turn into a crosswalk. Our laws aren’t strong enough–and the weak laws that we have aren’t even enforced. Please please back efforts to strengthen enforcement of our traffic laws and to pass stricter ones. A tow truck driver fatally struck Donna Hahl in a crosswalk. Motorists have killed at least 15 people walking on Jamaica Avenue since 2009.